I have not been sleeping well lately and, as a result, find myself mentally ill-prepared for the kind of critical and creative thinking this blog requires. And I have nothing already written on hand that I can adapt for use here. I remembered that today is Good Friday, and while I’m not Christian myself, chances are good many of my readers are, so I thought maybe I could write something Easter-related. But I couldn’t think of anything. I hopped on my favorite search engine, hoping to find something interesting I could at least recommend to you, but I didn’t see anything inspiring. Then I thought to look up climate change and Passover. Of course, Passover is not for several weeks, but it’s still, roughly speaking, seasonal. Easter and Passover are certainly connected. And, as it turned out, “climate change and Passover” makes a really good search term if you want to find some interesting reading. So, under the joint influence of my extreme sleepiness and my sense of duty to my readers, here are a couple of recommended links. Categories: Climate Solutions, Human Rights | Tags: climate change, Easter, Passover | Permalink. I have talked about climate and food before in terms of how climate change influences the food supply, but what about the other way around? How does our eating influence the climate? As many readers are probably aware, a significant amount of our collective carbon footprint (about one quarter) comes from our food system and meat-based foods have a larger footprint than plant-based foods. But how much difference between foods is there? What is the best way to cut carbon emissions out of one’s personal diet? Does it matter whether the meat is local or free-range? I didn’t know either. So I’ve done some reading. The short answers are that the difference is huge, the best way to cut emissions is to eat less meat, and free-range and local do matter but, as far as the climate goes, not very much. There are some complications and nuances, of course. I found an article that includes a graphic showing the carbon footprints of various food types (chicken, beef, eggs, lentils, etc.) expressed in kilograms of carbon dioxide equivalent (CO2e) per kilogram of food. “Carbon dioxide equivalent” means all greenhouse gasses taken together and expressed in terms of their impact on climate. So these figures include methane. Logically, the numbers would be exactly the same with any other measure of weight–the point is there is a ratio between amount of food and amount of emissions. Lamb is the most carbon-intensive meat by far, at 39.2. Less than five of that is transportation and processing, which presumably means that if you raised your own lamb in your back yard, killed it yourself, and then had a carbon-neutral barbecue, it’s number would still be around 36. The next-closest competitor is beef, at 27, and then the other animal-based foods on the list cluster between 13.5 and 4.8. In contrast, the various plant-based foods on the list all cluster between just under three and just under one. The importance of transportation and processing varies, but only in potatoes is it the majority of the total figure. I can think of several possible complications (besides grass-fed vs. grain-fed, which I’ll get to later). What if the animal is a by-product of another industry? For example, if a flock of sheep are managed for milk and wool as well as meat, so that only excess ram lambs are slaughtered, then the carbon footprint of the flock is the same as it would be if those excess animals were not eaten (letting them live as pets would actually increase the carbon footprint of the operation, aside from the other ethical questions involved). In such a case, the same kilogram of CO2e has to share meat, milk, and fiber,and the whole operation is much more efficient than it might seem, right? Do the figures for animals include emissions from transporting animal feed? Why is the footprint of cheese six times that of yogurt given that most of them are processed milk? The study focused on food in Britain; are these numbers different in other countries, such as the United States? What is the footprint of highly processed foods, such as candy or fast food? Since different kinds of food have different nutritional profiles, how would this comparison work if the unit of comparison were nutritional value, rather than weight? Nutrition is complex, so it might be impossible to do that kind of study, but the issue could still be important. I do not have answers to those questions. In any case, clearly generally similar diets, such as two different versions of mostly-plant-based omnivory, might have extremely different carbon footprints. The study that released these numbers found that while the difference between eating a lot of meat and eating a little is huge, the different between eating a little meat and none is small. What is so bad about meat? The clear take-home message here is that giving up beef and lamb (except possibly where these are byproducts of dairy production? ), and cutting way back on other animal-based foods, is one of the most powerful steps a person can take to address climate change (aside from voting!). So, why are meats so bad for the environment? We have to be very clear, here; this is not about animal rights, which is an important but separate issue. I have not seen this issue addressed directly, but the Second Law of Thermodynamics, not to mention public tastes in food, is almost certainly relevant. The Second Law states, in essence, that every time energy moves or changes form, some of it is lost. This is why, for example, a ten pound house cat needs to eat more than ten pounds of meat in its life. This is also why ecosystems always have more plant-eaters than carnivores and more plants than plant-eaters. Most of what an animal eats does not become meat–what happens to it? Some of it becomes bone or other tissues we don’t want to eat. Some of it is never digested and simply passed as feces–which decomposes into carbon dioxide or methane–or as flatulence, which is also methane. But most of that missing food is exhaled as carbon dioxide. One way to think about this is that all carbon that is taken up by plants is ultimately either interred in long-term storage as fossil fuels, or released again to the atmosphere when the plant rots or burns or is metabolized and exhaled. Eating food is the exact chemical equivalent of burning fuel. So, when a human eats a pound of plant matter, “burning” that “fuel” results in carbon emissions. But when we eat a pound of meat, that meat represents all the plants that animal ate to grow that meat–and all of that plant-fuel is “burned,” whether in the meat-animal’s body or in the human’s. More plant-fuel burned means more emissions released. Cattle and sheep are both ruminants, meaning they don’t actually eat food directly. The food they swallow is eaten by bacteria in their guts, which in turn create food for the cattle. So you get another layer of energy transformation and thus another layer of energy dissipation–the bovine gets less energy out of the food and has to eat more, so more plants are “burned” as “fuel” for somebody. And the waste product of these bacteria is methane, which is a very powerful greenhouse gas. So, meat has a larger carbon footprint than vegetables and ruminants (cattle and sheep) have a larger carbon footprint than other animals (pigs, chickens, turkeys, etc.). Most animals raised for the industrial food supply spend at least part of their lives–and sometimes all of them–in some version of a small cage being fed some kind of grain-based, heavily processed diet. There are all sorts of reasons why this is a terrible, horrible thing and why if you are going to eat meat, you should really choose only free-range animals (please note that “free-range” is a legally slippery term and that finding meat that lives up to the intent of the phrase takes some research). Is the climate another such reason? The answer to that one depends who you ask. An animal’s personal freedom has no particular bearing on carbon emissions. What makes the difference is whether it is grazing or browsing, as opposed to being fed corn (as would happen in a cage or cage-like feedlot). Logically, feed carries a larger carbon footprint because it must be transported and processed, whereas pasture is eaten where it grows. In fact, one of the best ways to keep open land from being converted into housing developments is to put cows on top of it. All of that argues for grass-fed meat having either a smaller carbon footprint, or possibly a slightly negative footprint, if pasture sequesters more carbon than cattle release. On the other hand, cattle, at least, have to live longer to get to slaughter weight if they stay on pasture. More time living means more time farting, which could mean a larger carbon footprint. And while cattle are healthier eating grass, they get more energy from eating grain (which must be why they gain weight faster that way). So a day eating grass presumably means more farts than a day eating grain, too. Which argument is actually true seems unclear at this time and might depend on the details of the cattle operation in question. And I have not found anything on how free-range living might influence the carbon footprint of other food animal species. Wait–haven’t there always been cattle? This question was posed by one of my Facebook friends and it’s a good question. How could cattle be a factor in increased climate change given that cattle themselves are hardly new? 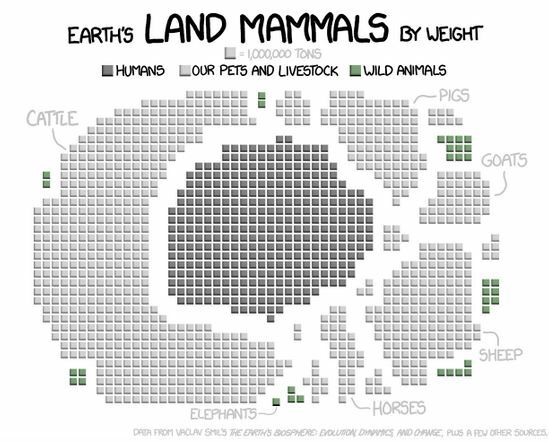 This graphic shows that almost half of the land mammal compliment of the planet, by weight, is cattle. The vast majority is either humans or animals that humans eat. The reason it makes sense to do this comparison by weight rather than by head is that weight is a good proxy for how much animals eat and, thus, how much plant “fuel” they burn and how much CO2e is released. Consider that the energy in a pound of mouse meat is probably similar to the energy in a pound of hamburger–about the same number of calories. There are some potential complications here, but two thousand pounds of mice probably eat very roughly the same amount as two thousand pounds of cow. So, the fact that our planet has a huge number of tons of cattle right now means that a huge amount of plant-fuel is being “burned” by cattle these days. Now, I am fairly confident that while there have been cattle for millennia, there have not been THIS MANY cattle until very recently. I also suspect that this massive pile of mooing would not be possible without fossil fuel–and it certainly wouldn’t be economical. Feed could not be cheaply moved in to feed lots and beef (grass-fed or grain-finished) could not be distributed widely enough to meet enough consumers to justify the size of the herd. If this is the case, then excessive cattle farts are simply another symptom of fossil fuel use. But, even if the huge herd of cattle is new, surely something else was eating all those plants before, and releasing a corresponding amount of waste and flatulence? Like, all the wild animals we’ve squeezed out of existence lately? Maybe and maybe not. Perhaps a lot of those plants used to just not get eaten and to enter into long-term storage on their way to becoming fossil fuel. Or maybe the wildlife released more carbon dioxide and less methane and so had a lower carbon footprint. There are possibilities. Or maybe the farts of cattle are actually irrelevant to climate change and the real carbon footprint of food is only the fossil fuel use and the ecological degradation associated with it? That one I do not know. Categories: Climate Science | Tags: carbon dioxide, cattle, food, global warming, greenhouse gasses, lifestyle changes, meat, methane, science explainer, sheep, veganism, vegetarianism | Permalink. Hi, all. Sorry I missed yesterday’s deadline–I was occupied by my day job. Which brings up an important point I’ve been meaning to write about, namely, the finances of this here blog. The short version of the story is that I need money and I want your help to get it. This is always a difficult admission for a writer to make, because there’s this misconception that writers should be motivated by our muses (and our concern for issues, like climate change) and not by money. We say “it’s a labor of love,” as though there were something noble about not being able to pay the rent. Where does this bizarre idea come from? Frankly, I suspect it is a remnant of European class consciousness, but that it another topic for another blog. I’m tired of not having enough time to do important work, like write this blog, because I’m too busy doing unimportant work to pay the bills. So, this is where I ask you for help. There is a lot you can do, ranging from the quick and simple to the impressively involved. For a donation drive to really work, I need a lot of readers. The more readers I have, the lower the average donation could be and still allow me to do this work full time. Also, of course, this topic is important and more people should read it! Where you can help is by posting links to this blog on your social media and my emailing links to friends you think might like to read it. It takes two seconds, costs nothing, and would help an unbelievable amount. Really. I have a donate button already. Just click on it. Imagine if this blog were a magazine–would you buy a copy? How much would you pay? When I started out, I had a partnership with an environmental organization that gave me a modest stipend to support my work. That partnership ended some years ago when their finances took a hit and they could no longer afford my stipend, but the collaboration had a lot of mutual benefits and I’d like to do something like that again. Could you be this blog’s partner? The way it works is that you, or your organization, commits to providing a portion of my funding every month because you recognize that my mission (ending anthropogenic climate change) is also your mission. We’re talking something between fifty and a few hundred dollars, an actual chunk of money, but less than if you had an employee covering the same topics for you. I would retain ultimate editorial freedom, but you could request posts on particular subjects and I would publicly acknowledge you as a sponsor or partner. If this sounds interesting to you, shoot me an email; cailanthus@gmail.com. Ideally, I’d have two or three such sponsors, both for security in case one had to withdraw and so that each sponsor’s donation could be smaller and still cover my expenses. So, what would it look like if this blog were funded? What are my actual financial needs for the project? It’s a fair question–if I’m asking for money, you should know how much money I need, what I’d use it for, and how this blog would benefit from being funded. My primary expense is time; when I’m working on this blog, I am not working on other projects that could earn me money. I also have to pay for Internet and electricity, and I’d use slightly less of either if I did not write this blog. I sometimes have other expenses, such as when I travel to climate rallies and then write about them. But, basically, we’re looking at the opportunity cost I pay when I work for free. Right now, I spend about ten hours per week on this project, writing and researching. As a free-lance writer, I make about $15 an hour, which is about the minimum living wage in most areas. There are writers to get less. The finances of my industry are seriously twisted. Anyway, $150 per week, or $675 per month, would cover the opportunity cost I currently pay. As a reader, you wouldn’t see much difference, except that I’d be a lot better at meeting deadlines, but it would make a real difference in my life. So, what if I got more? $300 per week, or $1350 per month, would allow me to double the time I spend on the blog to twenty hours per week. That you would notice, because I’d be able to edit every post (most of my posts are first drafts) and I’d be able to research stories in much more depth. You’d see consistently excellent writing and you’d see more interviews, more posts covering ongoing stories at depth, and more posts covering topics that you might not otherwise find out about. Real investigative journalism. What if I got more? I’d be unlikely to go full time with this one project, because the universe is big and exciting and I have a lot of interests. I could, of course, pay myself more than $15 per hour, but I probably wouldn’t. Instead, if I could raise $600 per week or $2700 per month, I’d continue putting about 20 hours of my own time into this blog and I’d pay someone else to help me (part time). What would my helper do? There are lots of options. Maybe my helper would review the scientific literature on climate change and compile monthly summaries of any developments so I could pass those stories on to you. Maybe my helper would be a marketer and expand my readership into the tens of thousands. Maybe my helper would manage an online book store focused on climate-related literature. Maybe my helper would be a fundraiser and transform this little operation into a small but fully funded team doing all sorts of great things. As far as I can tell, I have between twenty and forty regular readers, plus occasional readers who come and go. I have never met, or even heard from most of you, but I appreciate all of you just the same. Let’s say that when the next post comes out on Tuesday, each of you posts the link to your social media and emails it to a couple of interested friends. This blog will then be exposed to hundreds, maybe thousands of new readers. Some of them will like what they see and visitation will jump. Maybe my readership will double or triple. That would be great for climate sanity. I will let you know how it goes. So, if all of you help spread the word, I could go into April with somewhere around a hundred regular readers. If each of you then decides to kick in $5, my opportunity cost for the month will be almost entirely covered. That would be great. I’ll be able to work for the environment and make a student loan payment. And let’s say that among those new readers there are two or three who are willing and able to become sponsors. Three people who each decide to put up $500 per month for climate-focused environmental journalism. That, plus ongoing small donations from readers, would take me up around the level I’d need to not only make this my real part-time job, but also to hire a part-time assistant. We’re talking quality writing, in-depth reporting and discussion, and the expansion of this project into a major resource for climate sanity, all because you shared a link on social media a few times. Categories: Climate Solutions | Tags: climate action, climate change, climate sanity, environmental journalism, funding | Permalink.